Lara has had a lot of makeovers and facelifts over the years, changing studios, actors, and whole storylines with alarming regularity for long-term fans. 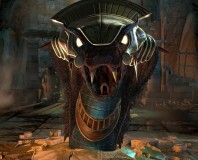 This is the first time that Eidos has given the main face of the of the series a complete genre overhaul, though, swapping the usual third-person antics for a top-down, two-player take on the tomb raiding profession. Hell, Eidos has even changed the name – dropping the Tomb Raider tag in favour of something more focused on Lara herself. Oh, and the Guardian of Light, don’t forget him! With all that obviousness in mind, it’s the strangest thing to find that the core gameplay hasn’t actually changed all that much. You’re playing from a new perspective and Eidos has upped the pace of things so that it at times feels evocative of Diablo or Torchlight…but underneath all that, it’s still good ol’ Tomb Raider. In fact, there’s arguably more actual raiding of tombs in The Guardian of Light than there has been in other recent games. He can't see you if you don't move! No, wait, that's the T-Rex, nevermind. Thankfully, that’s only the starting point and what Lara now lacks in emotional import it now makes up for in pace. There’s no faffing about and by the time the opening sequence is done with, it’s all spelled out; basically Lara, at gunpoint, is forced to retrieve an ancient artefact for mercenaries who then accidentally unleash an Aztec devil. 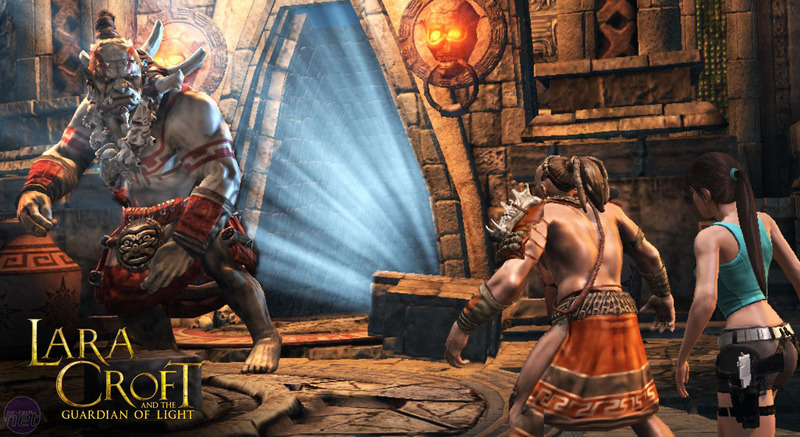 It falls to Lara and a resurrected Aztec warrior, Totec, to save the world and put the genie back in his bottle. Giant balls are a recurring motif. Were the Aztecs compensating for something? What follows is a blisteringly quick romp through all sorts of ancient ruins which mix classic Tomb Raider puzzle-solving with an overt arcade focus of a type that hasn’t been seen in Tomb Raider before. In co-op play each player gets a score counter, which swells visibly with every monster killed, urn broken and giant floating diamond run over. Onlookers may have described the action as Tomb Raider meets Diablo, but in truth it feels more like Tomb Raider meets Mario at times. That said, there are still RPG influences. 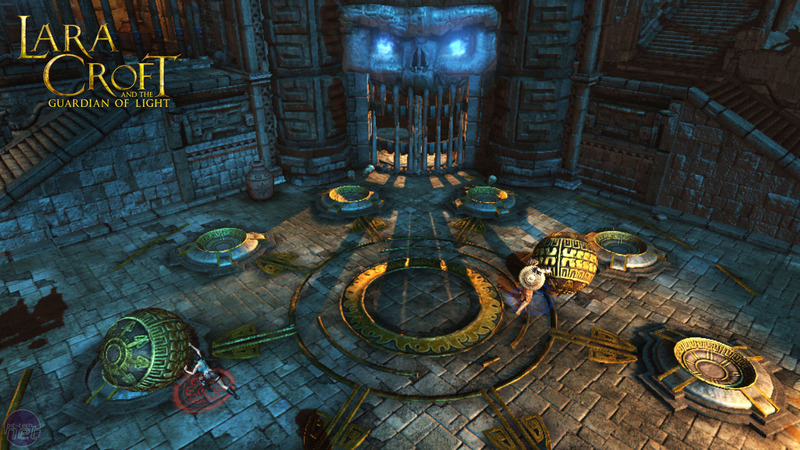 Lara and Totec collect different weapons as they progress through the levels, moving from pistols and spears to shotguns, rifles and even flamethrowers. It’s odd to see that Lara, who’s adventures usually only involve killing a few dozen tigers, is called to murder giant spiders by the hundreds in the opening levels of Guardian, but it feels good too. It’s important to note how well the game is balanced too. Unlike the comparable co-op shooter Alien Swarm, Lara works perfectly well if you’re not playing in co-op mode and does a decent job of scaling to single-player styles. If you’re low on pals or if you just want to play the first run solo then you’ll have nothing to worry about, as in many ways that’s how the game is best experienced. A second player will only slow you down as you’re forced to coordinate tactics. 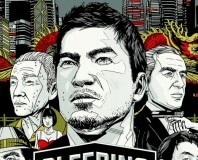 Is Sleeping Dogs just GTA in Hong Kong? Joe takes a look and reports back.